The rejection emails pile up in my inbox. I learn not to take the “your essay is not a good fit for our publication” message personally. At times, I laugh at the thought of 22-year-old editors from college literary journals judging my submission. How can they even begin to understand my stories about events which occurred before they were even born? Their rejection letters make me feel old and insignificant. There are times when disappointment begins to erode at my determination to find venues that let me tell my stories and my truth. But then comes an email telling me that my work has been accepted for publication. Finally, there is an editor that has been touched by my words. At that moment I forget about all the rejections that have caused me to doubt myself. Because finally, I am able to share my words with the world. Sixteen members were in attendance. We had one visitor, Evelyn Thibaudeau. 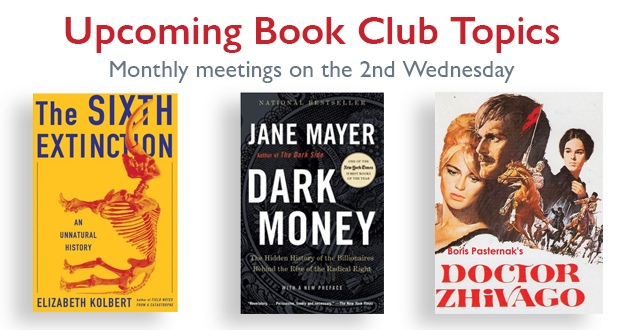 The WWW Book Club monthly meetings will be held on the Wednesday after regular WWW meetings. The 2019 schedule will be as follows, with meeting places to be announced. Book Club will not meet during the summer months, June thru August, but will resume in September. Dates and locations to be announced at a later time. Congratulations to Irene Sulyevich whose prose, “How I Cheated on the Black Sea” has been accepted for the upcoming Boom Project, a literary anthology of the Baby Boom Generation of the Ohio River Valley. Join Women Who Write as we celebrate Women’s History Month in March with special community events and a new spring Writers Retreat. 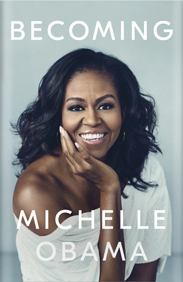 Kentucky Women’s Book Festival – Saturday, March 2, 2019 at the University of Louisville. WWW is a sponsor of the Kentucky Women’s Book Festival which brings noted writers to a morning of workshops and readings. It was founded by Carridder Jones, who was also the founder of Women Who Write. WWW member, Cheri Powell will lead a workshop on “Scene Development” from 1:30-2:15 pm. 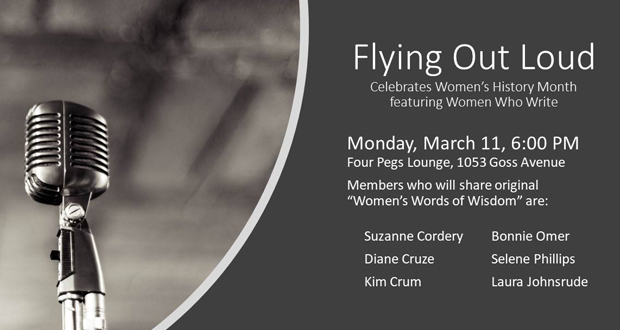 Flying Out Loud – Monday March, 11 at 6 pm at Four Pegs Lounge on Goss Avenue. Flying Out Loud, a monthly Literary reading event will Celebrate Women’s History Month by featuring Women Who Write members. “Women’s Words of Wisdom” will showcase six of our members reading their works. We hope you will make plans to attend. 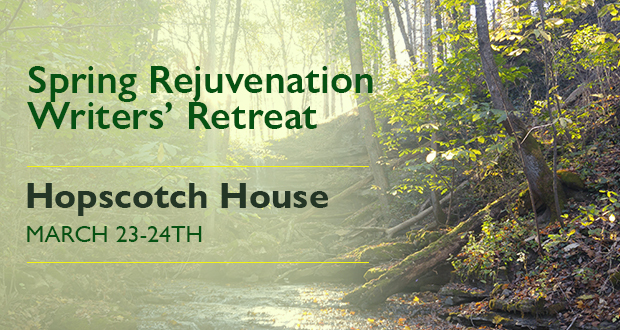 Spring Rejuvenation Writer’s Retreat – March 23-24. In 2019 WWW is adding an additional Spring Writers’ Retreat at the Hopscotch House. Come for a few hours, spend the day, or register as an overnight guest (accommodations are limited to 9 guests). Bring your writing project, enjoy the outdoors, and socialize with old and new friends who share your same interest. This is a MEMBERS ONLY event. Creative Nonfiction seeks submissions for an upcoming issue dedicated to Memoir. Deadline: February 25, 2019. We’re looking stories that are honest, accurate, informative, intimate, and—most importantly—true. Whether your story is revelatory or painful, hilarious or tragic, if it’s about you and your life, we want to read it. Creative Nonfiction editors will award $2,500 for Best Essay and two $500 prizes for runner-up. All essays will be considered for publication in a special “Memoir” issue of the magazine to be published in 2020. Essays must be previously unpublished and no longer than 4,000 words. Public reading: Tuesday, March 19, 6:00 pm. Writers over age 55 are invited to submit poems, stories, essays, or memoirs drawn from the writer’s personal history. Manuscripts should be limited to 1,500 words (about five, typed, double-spaced pages, which may include up to five poems). Please include a $10 reading fee per five-page entry, payable to the Carnegie Center. Entries must also include a cover sheet complete with writer’s name, address, e-mail address, phone number, and date of birth; names and contact information should NOT appear on the manuscript itself. Manuscripts will not be returned. Entries will be judged by a qualified panel. The prize is $100 for first place and $50 for second place. Winners and finalists will be invited to read at the Legacies Reading on Tuesday, March 19 at 6:00 pm. The reading is open to the public. Entries must be received or postmarked by Friday, February 8 at 5:00 pm. Next Great Writer Contest – Submission deadline: Friday, May 3. Public reading: summer (date TBA). Writers are invited to submit manuscripts of fiction or nonfiction prose (up to 2,000 words) or poetry (up to 5 poems). Please include a $10 fee per entry, payable to the Carnegie Center. Entries should also include a cover sheet complete with writer’s name, address, e-mail address, and phone number; names should NOT appear on the manuscript itself. Manuscripts cannot be returned. The prize is $150 for first place and $100 for second place. Winners and finalists will be invited to read at a public reading this summer (date TBA). Entries must be received or postmarked by Friday, May 3 at 5:00 pm. The Kentucky Foundation for Women Summer Residency Program at Hopscotch House. As any writing instructor worth her salt will tell you, the key to developing as a writer is devoting your time and energy to the craft. But, as any busy budding writer might attest, that time can often be difficult to come by in the hustle and bustle of modern life. In this workshop, writers will learn strategies for cultivating a healthy daily writing practice. The focus of this workshop will be on generating fresh, new work and healthy, new strategies. Instructor: Sarah Anne Strickley. SEATS ARE LIMITED.